See SchoolFlex in use by visiting some of the sites we've recently developed. 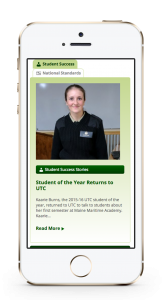 RSU 18 is a school system which represents several rural Maine communities and wanted an online presence that accurately reflected the excellent work being done in its schools. Moving to the WordPress content management system from outdated proprietary software enabled RSU 18 to better utilize technology and showcase its learning environment. 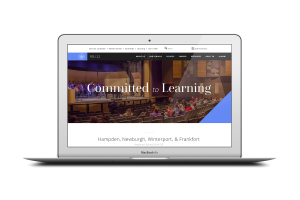 The WordPress multisite setup enables the administrators of the K-12 school district to control and update each of the school websites from one place. Convenient features such as network-wide aggregated news and events, a modern design, schedules, alerts, customizable quick links, and clear navigation increase RSU 18’s ability to effectively communicate with its communities. The site features beautifully displayed and integrated Google calendars and network-wide navigation for key items – bus schedules, nutrition, parent portal, and district contact. Finally, the network-wide search offers keyword-based results pulled from every site in the network and a well-designed mobile experience, allowing them access to vital information while on the go. The concept of our SchoolFlex product could likely be traced back to our first iteration of the Bangor School Department network from 2012. We’ve learned a lot in four years about what makes a great school website platform and we were pleased to get the opportunity to relaunch the Bangor School Department sites on the latest version of SchoolFlex. 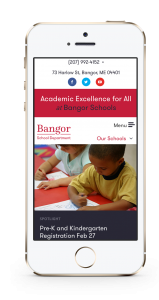 The Bangor School Department network serves a large community of teachers, students, and parents in an easy-to-manage, and mobile responsive, multisite setup for administrators. Bangor Schools also took this opportunity to easily launch extra sites on their network to serve audiences such as Alumni. 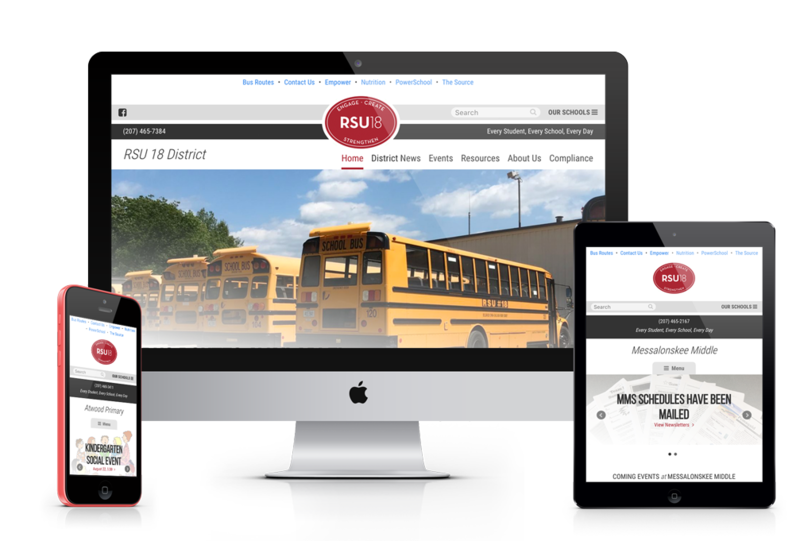 Encompassing several small towns, the RSU 22 school department chose to build its latest network of websites on RainStorm’s agile school website platform SchoolFlex. The multisite setup of SchoolFlex enables the administrators of the K-12 school district to control and update each of the seven school websites from one place. Convenient features such as network-wide aggregated news & events, a modern design, schedules, alerts, newsletters, and more, are increasing RSU 22’s ability to communicate with its communities. 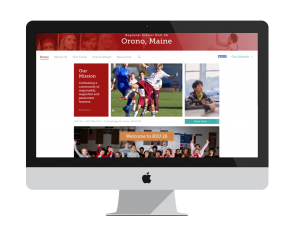 The Orono School Department also sought RainStorm to help relaunch their school websites on the SchoolFlex platform as well as optimize them for mobile. Similar to Bangor and RSU22, Orono utilized a multisite setup that allowed administrators to have one central location to manage their network but empowered each individual site to have its own content, personality, and management capabilities. We wrapped up all of their new technical capabilities in a beautiful, custom design. The Dr. Lewis S. Libby School’s previous website could only be updated by one staff member with fairly specialized knowledge of their website. 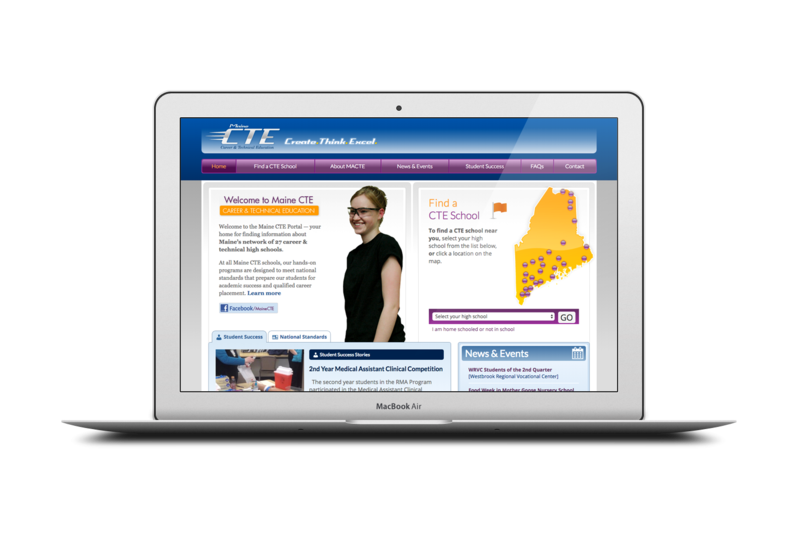 We helped migrate them to a new site using SchoolFlex. The school chose to keep things simple and straightforward, with a focus on their mission and easy access to news, photos, and the calendar — especially when on a mobile phone. 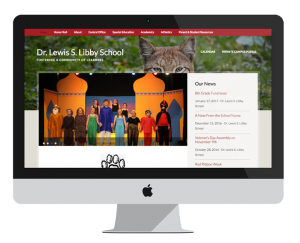 A simple design was utilized which allows the school to update photos, share stories and information, and even change out its wildcat mascot to match the seasons. School staff now manage the site and share information more easily with their community. Maine’s Career and Technical Education schools — a statewide network of 27 alternative high schools providing hands-on education in the fields of nursing, culinary arts, automotive, IT, carpentry, and more — wanted to raise their profile, telling the CTE story to prospective students and Maine as a whole: a story filled with options for all high schoolers and amazing student achievements. We migrated the former MACTE websites to a WordPress multisite system with only slight modifications to the original design. SchoolFlex features offer each school a consistent layout customized with a school’s logo, choice of select themes, and individual courses, staff, and content. Schools use custom-developed modules to publish course descriptions, teacher bios, news items, student success stories and can view and process online applications.